Hindi newspapers and the opinion of village elders are the two major factors that influence the voting decision of the first-time rural voter. This insight is based on the interviews of more than 60 first-time rural voters of Jewar, Uttar Pradesh (UP). 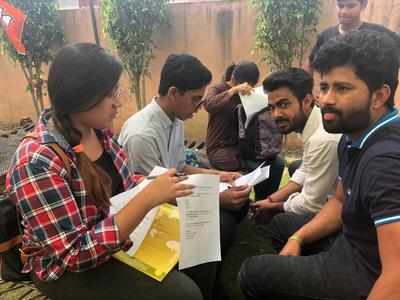 The interviews were taken by the first-year students of Times School of Media during the campaign trail of Lok Sabha candidate, Union Minister of State for Tourism and Culture, Dr Mahesh Sharma. First-time voter, Ravi Sharma, 19, who is a resident of Faleda Bangar village in Jewar, UP, said “We rely on newspapers and our village elders in deciding who the village will vote for.” Faleda Bangar village, which is an hour from Bennett University, and has a population of 7,000 people of which 5,500 are voters. Young men such as Rajput and Sharma are among the 12.6 lakh young voters in Uttar Pradesh who are being wooed aggressively by political parties. Clearly, political parties can reap benefits by winning over this young population. But what are the expectations of the rural youth from the new government? Lokesh Yadav, 19, from Tirthali said that he would vote only for a party that delivered on its promises. “I expect the new government to develop our village, build roads, hospitals and colleges,” he said. The village pradhan of Faleda Bangar, Bholu Sharma, said his village still needs a nurse and a doctor in the healthcare centre. “We also hope a gaushala will be made in our village,” he added. This is certain that rural youth want only one thing: results. Today’s youth will not cast their vote based on hearsay or promises, but on the issues of development, delivery and results.